These days, if it’s not on video, does it even count? For university students who are increasingly clicking to view rather than hitting the stacks, not so much. For tech managers, this means evolving systems to meet the demands of a very visual Gen Z that wants the ability to access content from any device, whenever. Here are some tools that can make this happen . . .
1 Beyond’sAuto Tracker PTZ camera acts as a spotlight––without the need for an operator. Employing image recognition and motion detection technologies, the system follows the lecturer automatically, and will pan, tilt, and zoom on its own. HD-SDI outputs enable users to connect to a capture system. And, for an added layer of street cred, Auto Tracker was beta tested at MIT. Designed to keep things simple, Crestron’s CaptureLiveHD system handles scheduling, recording, and content delivery––all in one box. Lecturers may use a number of sources, such as HD video, laptops, whiteboards, and annotators thanks to its HDMI and RGBHV inputs. There is also a composite video input for a camera, as well as an audio input for a wireless microphone. One step up is the CAPTURE-HD-PRO, which includes a 3G-SDI input for HD cameras. Echo360’s POD enables instructors to plug in their laptops and start class––and record everything for posterity. Designed for podiums and table tops, the POD captures full motion output from HDMI sources, including laptops, projectors, and document cameras. The company’s PRO solution supports both analog and digital inputs (composite, VGA, HDMI, or 3G-SDI). With a professional grade-2 Megapixel ½.8-inch sensor and a 20x optical zoom, Marshall Electronics’ CV620 PTZ camera features broadcast settings such as gain, white balance, exposure, and auto/manual focus. The camera offers 340 degrees of horizontal pan and 120 degrees of vertical tilt, and includes a number of mounting options, including tabletop, wall brackets, and ceiling mounts. Flippable image options are also available. The Monarch LCSby Matrox Video is a lecture capture appliance that will support video from SDI and HDMI cameras, as well as presentation content from computers over HDMI. The device’s two inputs may be encoded independently or synchronized for use with multi-stream video players. Or, prior to encoding, the inputs may be combined to support picture-in-picture and side-by-side layouts for use with standard video players. Panopto’s Lecture Capture platform isn’t just for the lectern––instructors may teach from wherever they happen to be, via PCs, Macs, or mobile devices. The platform, which doesn’t limit the number of machines that can be installed on it, will integrate with Blackboard, Moodle, Canvas, Sakai, and D2L, and provides a set of APIs that allow for integration with room control and Web conferencing systems. 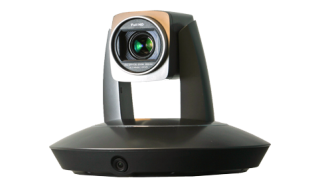 Sonic Foundry has enhanced its Mediasite platform to include Mediasite Join, a videoconferencing capture solution. Join will record and transcode single and multi-point videoconferences, which are then published to the Mediasite Cloud or Mediasite Enterprise Video Platform. The service has built-in analytics to enable administrators to see who is watching the content, and for how long. A fully assembled podium, Sony’s Lecture Capture System (LCS) comes equipped with monitors, a camera, audio (including a wireless mic), video processing, Crestron control, connectivity (both wired and wireless), an input/output panel, and a cable management system. The podium also incorporates a Sonic Foundry Mediasite RL recorder, and an agnostic platform is available for other capture systems such as Panopto, Echo360, and Kaltura. Providing a 74-degree horizontal field of view and a 20x zoom, Vaddio’sRoboSHOT 20 UHD PTZ camera integrates a 9.03 Megapixel Ultra High Definition sensor. The camera delivers native video at 2160p/30 (3840 x 2160), and will support HD resolutions (1080 and 720). The RoboSHOT 20 UHD has built-in HDBaseT connectivity as well as simultaneous HDBaseT, HDMI, HD-SDI, and IP streaming outputs. Designed to alleviate the hassle of what to do with cables, VDO360’sClearwater is a combined camera/computer (read: no need for USB connectivity). A Compass camera is integrated into an Intel 5th generation i5 PC and mount, and includes The Crystal, VD360’s Bluetooth speakerphone; a Flare IR preset recall button, and a wireless keyboard and mouse. An IR remote provides camera control. For those who want a completely wireless system, this is almost the answer, save for the cord that powers the PTZ PC.